Okay...haven't been posting pics of the cheeky one for quite a… - A mummy's inane blabberings.. Guess who bought shoes to match his son's? Aidan was so pleased! "Same shoes..same color!" he exclaimed with delight! Like all boys, Aidan loves to play with toy guns. But I'm just not comfortable with it somehow. But his doting grandparents who always pander to his needs bought it for him instead. Knowing that we wouldn't be pleased, the toys are left at their place and the boy only gets to play with it when we go over to their place for lunch every Sunday. I don't know..maybe seeing him with guns is a reminder that he would have to serve NS one day. Just recently, during the 'Tammy' incident, I was commenting to my friends (who had daughters) that I was thankful that I didn't have a girl. One of them responded "But your son gotta do NS!"..Touché! I'm definitely not looking forward to that day especially after hearing all the horror stories of NS. Sure, national service does build up one's character and strength..One of my ex-boyfriend totally enjoyed his NS days (he was a commando) saying that it had taught him to be disciplined and independent. And he proved it by doing extremely well in uni and graduating with a 3.5+ GPA and is probably earning big bucks now. Guess I've been influenced by my other half who thinks that NS is a pure waste of time and it is too much sacrifice for the guys. He maintains that girls should also do NS too *bleah*.. He's just received his MR (posted to Mindef Reserve) letter which means that he doesnt need to do reservist anymore and you should see the joy on his face..
My li' nephew Tyler who is just over 6 months old have grown so much! He's 9kg and sooo chubby! He's such a cute li' thing. 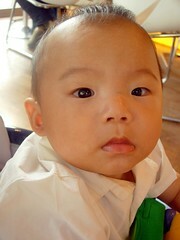 He has the same hairdo as Aidan when he was that age! I guess it runs in the family.. Tyler really resembles my dad..especially when he smiles..
how come your mom look so tanned & you're so fair? my mom is naturally dark-skinned. My sis is very fair too..much fairer than me. i used to much darker when i was younger especially when i was very into sports. grew much fairer after i started work but i tan very easily. if you see my arms, they are quite dark because of my trip to desaru..my face wasn't tanned because i was wearing a hat and sunglasses most of the time (damn hot lah!).. What pretty eyes Aidan have! I hate Crocs on the basis of principle (cos I find them clunky and ugly), but that is the cutest thing lah. And is it me, or does Aidan just keep getting more handsome?! Mind you, I don't usually gush over cute kids. But that cheeky happy face is just too adorable, lah. Tyler is 9kg !!! I can see why Jen has biceps. Keke same shoes. I didn't think YC would do that. yeah boy! 9kg at 6 months! 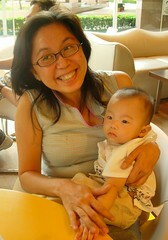 I think Aidan was just 9kg when he turned 1! i didn't think YC would do that either =) It sure made the li' boy's day! tyler looks tall for his age! and woah! 9kg at 6mths! 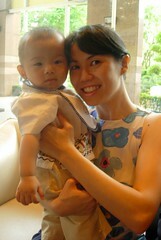 my nephew is 8kg at 10mths! he is tall and yeah..9kg eh! power! he has a great appetite which is great! erm..no lah. if i buy a pair of crocs, we can go join a circus liao hehe..
nah..i will look really funny in it..esp since im short and have short legs :P let the boys have same shoes! Tyler and Aidan are adorable, I especially like Aidan's watermelon pic. gawd..i think it's different for you guys coz the army postings are in real war torn areas..at least for the singaporean guys, it's mainly training but accidents do happen though..glad u need not worry anymore! Wow... look at that pic of you carrying Aidan. 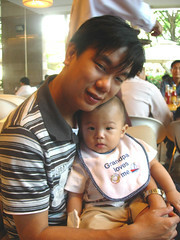 He has grown so much... the 3 yrs I am away.... I still can recall the tiny wee him on your lap at Brenners. So glad we can catch up again and no more long distance for A&M! ya ya! we can catch up more when u're back..probably will be living nearby too! Aidan's so cute. My friend told me that I should hope for a boy because then I would only need to worry about one d**k. If I have a girl, I have to worry about all the other d**ks. Hahahaha... quite true right? Terence also can't wait for the day NS ends for him. He hates it. I hate it too when he leaves me for a period of time. yeah..i hate it when hub had to do his reservist overseas! i do get worried at times. glad that it's finally over for him. ya know, now doing NS is no longer such a scary thing anymore. At least they have better food. No more flat sheets for their bed...and if kena tegan by sgt, you can complain to the big one. If you ask your hubby, I believe you will hear more horror story. yeah i think they made it less siong but it may depends which unit you are posted to too..
hubby told me enuff horror stories to make me worried (for the future)!